Welcome to "Float On It: A Creative community's" Blog. "Float On It" is a group of creative minds based out of Western Massachusetts where we bring you visual and listening pleasure. Every week "Float On It" opens a new window into the future of music, art, design, or, fashion, through this blog. "Transubstantiator, by Nicholas Stedman (whom you might remember as the guy that engineerd the crawling blanket), is another art piece that makes use of the very simple science phenomenon of "grocery" electricity. Transubstantiation is a a doctrine of the Roman Catholic Church, it describes the changing of the elements of the bread and wine, when they are consecrated in the Communion, into the body and blood of Christ. 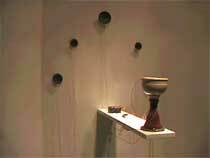 In the installation, a chalice of wine acts as a battery, providing power to a circuit that reads through a passage from the Bible. 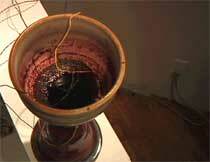 The passage is commonly used during Communion to bless wine. The wine is eventually depleted of energy and must be replenished. Stedman is one of the presenters at the upcoming Dorkbot Toronto, on December 2 and 3." "Float On It" is a group of creative minds based out of Western Massachusetts where we bring you visual and listening pleasure.